Here's the first thing you ought to know about a ranch. It's not the same as a farm. A farm is mostly cropland, see, which means that the land is plowed and planted to crops, such as wheat, barley, rye, corn, oats, alfalfa, soybeans, milo, sunflowers, and cotton. Watermelons are grown on farms and so are nuts, berries, fruit, and vegetables. I don't happen to eat vegetables. I mean, who ever heard of a dog eating spinach or carrots or broussel sproots...brussel sprouts, I guess it is...who ever heard of a dog eating such stuff? All those crops are grown on farms, not ranches. So what do we grow on a ranch? Heh heh. You'll never guess. Go ahead, try. I told you you'd never guess. We grow GRASS, the same grasses that have been here for thousands of years, long before I came along. Our ranch is what you would call “short grass country,” probably because our grasses are short, and we're talking about buffalo grass, blue gramma, wheat grass, and side oats gramma, with a smattering of Indian grass, little bluestem, and love grass in the rougher country. Those are your typical prairie grasses. Now, if you went up north, say to the Flint Hills of Kansas or the Osage Hills of Oklahoma, you'd find mostly tall bluestem grasses. If you went down south, where it rains a lot, you'd find still other varieties of grass, and they're quite a bit taller than ours. Our grass is short but it's got a lot of strength in it—if you happen to be a cow, that is. A cow can make a living eating grass. You and I could eat a whole trainload of grass and it wouldn't give us one bit of nourishment. That's because our little bodies weren't designed to digest grass, and aren't we glad? Who'd want to eat grass for breakfast? Not me. We dogs will munch on a few tender shoots of grass in the springtime, but that's just a temporary deal. It aids our diges¬tion and freshens our breath, but for the most part, we leave the grass alone. 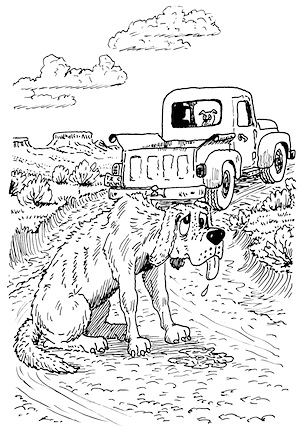 The Case of the Tricky Trap has a scene where I eat a bunch of green grass, then ride around in Slim’s warm pickup. Urg. I can’t reveal what happened, but it wasn’t pretty. Be sure to let us know what you think about Hank's advice on ranching in the comments section below!